The Bore Thunder™ Launcher Adapter is a reusable carrier that is designed to allow the deployment of the powerful Bore Thunder™ 12ga cartridge from a 37mm or 40mm less-lethal launcher. The Bore ThunderTM Adapter provides an officer the ability to deploy a strong and effective distraction or diversion, with zero risk of throwback. 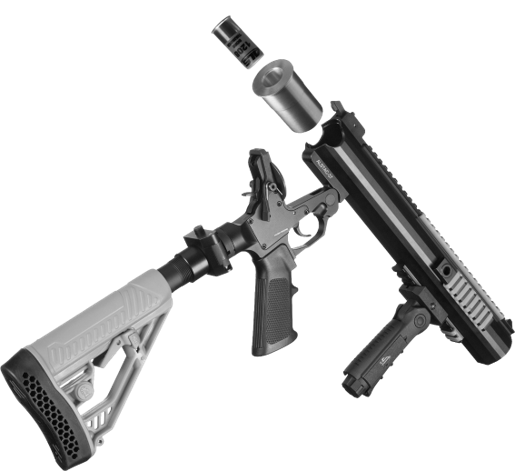 The ALS Bore ThunderTM Adapter uses the same technology found in the TRMR-LETM which restricts the deployment of a standard, lethal 12ga round in the heat of the moment. The Bore ThunderTM 12ga cartridge produces a forceful 172 dB, along with flash and overpressure.